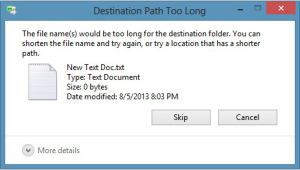 Windows gives users 255 characters for a file name. 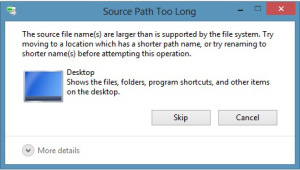 However, the file name doesn’t just include the title you give your folder or file, it includes each subdirectory along the path and the filename! You’ll get a Windows error message like the ones above. In some cases, you won’t get the Windows error. Instead you’ll get a message that just says “Cannot Copy”. In some cases, your files simply won’t open or might cause errors when opening or closing. Another issue is that the file context menu(right click) won’t have as many options as other folders with acceptable file paths. Shorten folder names or your file name! Consider your use of folder layers – eliminating a folder layer entirely would save characters! Be cognizant about where your saving files. You might think saving on the Desktop will save space but the actual file path to the desktop will be C:\Documents and Settings\%username%\Desktop or C:\Users\%username%\Desktop depending on your version of Windows.